My first ever featured favourite celebrity blogger is none other than Daphne Osena Paez! I was so elated that she graced my online interview. Daphne is a huge name in the Philippines but it didn't go to her head at all. She was described at Wikipedia as TV host, producer and a businesswoman from Manila. I'd describe her as an inspiring woman and an amazing mom to three girls. To begin with, she is the first Filipina ever appointed as Special Advocate for Children by UNICEF Philippines. She has her own line of Daphne® furniture and jewellery and just recently, she collaborated with National Book Store to launch Daphne® stationary products. I was a fan of Daphne since her F and Urban Zone days. She still appears on TV every now and then for special shows but what I really love about Daphne is her authentic and simple persona behind the glitz and glamour of the showbiz industry. My favourite blog entries of hers were the ones spent in Batangas with her family. She let her three precious girls mingle with the local kids. Very low-profile and awe-inspiring. I wasn't surprised anymore when Daphne agreed to be featured here at Sweet Memoirs without acting big and all. She is without a doubt very approachable despite her household name status in the Philippines. 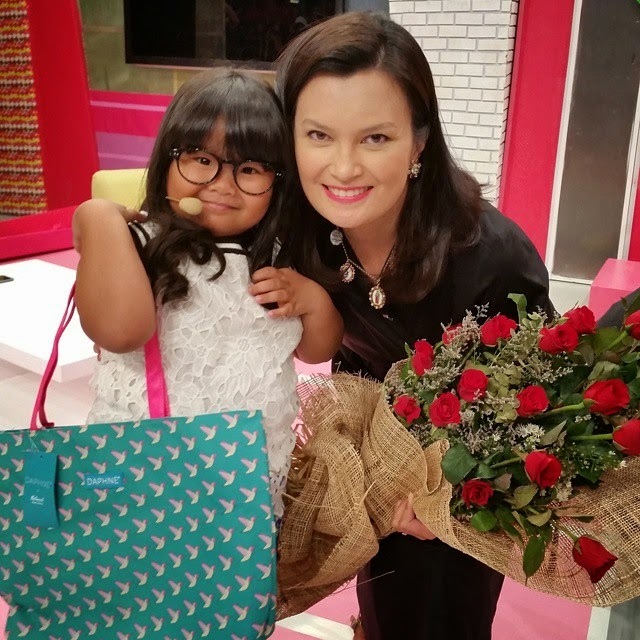 Cherry: Hi Daphne, can you share with us when and how did you start blogging? What was your primary reason for setting up a blog when you started? Daphne: I started "blogging" in 2005. Back then it wasn't really a blog. I had a Flickr account and I loved taking photos. Flickr is a photosharing site that existed even before instagram. I belonged to a community of like-minded people - most were moms in the Philippines and in the US. I only had one daughter then -Sophia. I was pregnant with Lily. And in Flickr, I documented the waiting game til I delivered Lily. In 2007 my friend Cecile Van Straten of Chuvaness suggested I start a blog. She helped me set up a LiveJournal (daphneosena.livejournal.com). I called it Daphne's Diary. I was still hosting shows then - Urban Zone and Proudly Filipina. I also had my own talk show in ANC. I wrote about outtakes from my shoots, interesting places, people I interviewed... and sometimes a bit about my home and family. The blog had a strong following. We were all doing it just for fun. No clients. No ads. Eventually the digital marketing scene caught on and advertisers and marketers showed interest. So we all had to do a bit of growing up. I remember, for one of her birthdays, I gave Cecile the URL www.chuvaness.com as a gift. She was also just on live journal then. But I thought one day she might want her own dot-com. The rest was history. For my part I also started buying URL names. I imagined that one day I would have a brand of lifestyle products and collaborate with big retailers. So I prepared myself for that. I registered my brands as registered trademarks. When I started having products, I knew it was time to re-brand and invest in good design. I hired a good then-unknown graphic designer Isabel Gatuslao to rework my logo and my blog. I migrated my site to www.daphne.ph. Cherry: If you are to give one piece of advice for someone planning to set up a blog or just starting out, what would it be? Daphne: Just be authentic. Be yourself. Do not try to copy others. And don't do it thinking you will make money and get ads. There's too much noise on the internet already. People don't want to see clones. People follow you and read you because you have an authentic point of view. And hopefully they will take your opinions to heart. That's the mark of influence. You don't just create it overnight. It is earned. In my case it isn't even about numbers (of followers). It's about credibility. I took care of my name and my work for almost 2 decades of working on television. Also have good photos. And don't be just a blogger. It's not everything. You have to do something else. Have an interesting life.... live it and sometimes share it. Cherry: Do you mind sharing with us your all-time favourite bloggers and tell us why you love reading their blogs? Daphne: The digital landscape is changing. People are not surfing the internet anymore. Less people are reading blogs. Everyone is just stuck on Instagram. And maybe twitter. But blogs will not stop existing. Bloggers are still creating. I love the point of view of Garance Dore. She was there when the whole blogging thing took off. When a handful of bloggers became legit media. I also love how she is dealing with her growth and the changes in tech. http://ohjoy.blogs.com is also a favourite. I like her work as a graphic artist. I'm inspired by the way her career has developed into design collaborations. Thank you so much Daphne for taking time to answer our questions and share your words of wisdom with us. Keep inspiring people from all walks of life and stay as authentic as you are! FYI: Daphne and her family explored Singapore as guests of Singapore Tourism Board in 2013. She was also recently honoured by the Senate of the Philippines as one of the 15 outstanding women who made valuable contributions in different areas of society. She has been featured in Vogue Italy and many other prestigious publications. Read more about her works and achievements at www.daphne.ph. I always liked her style. She's very simple, yet very elegant. Me too! I like her fashion sense a lot. I remembered her and that's so nice of her she'll be able to spare time and let us know what's her insights. She was really nice, she replies to email without a hint that she's famous. wow! ibang level ka na Sis, doing an interview with a known celebrety. I've seen her in some TV guesting ..
Haha! Di naman Papaleng. Magkaka-level pa rin tayo no matter what. I do not know her :-( so sorry. I missed Philippines entertainment news. Did not know her till now but she sounds like an amazing lady doing meaningful things. It's obvious you don't watch Philippine channel in the USA. Haha! I love Daphne for her simplicity, elegance and intelligence. I used to watch F, too. She's well loved for being simple despite her fame. I like Daphne's sophisticated fashion style and her wit and intelligence. I didn't know she's a blogger too. I'll start to subscribe in her blog. I don't know her but after reading your post on her, I'm her latest follower. What an inspirational woman. I love your blog too! Thanks for the compliment, Michelle! Yes, she's quite a woman of intelligence, beauty and heart.